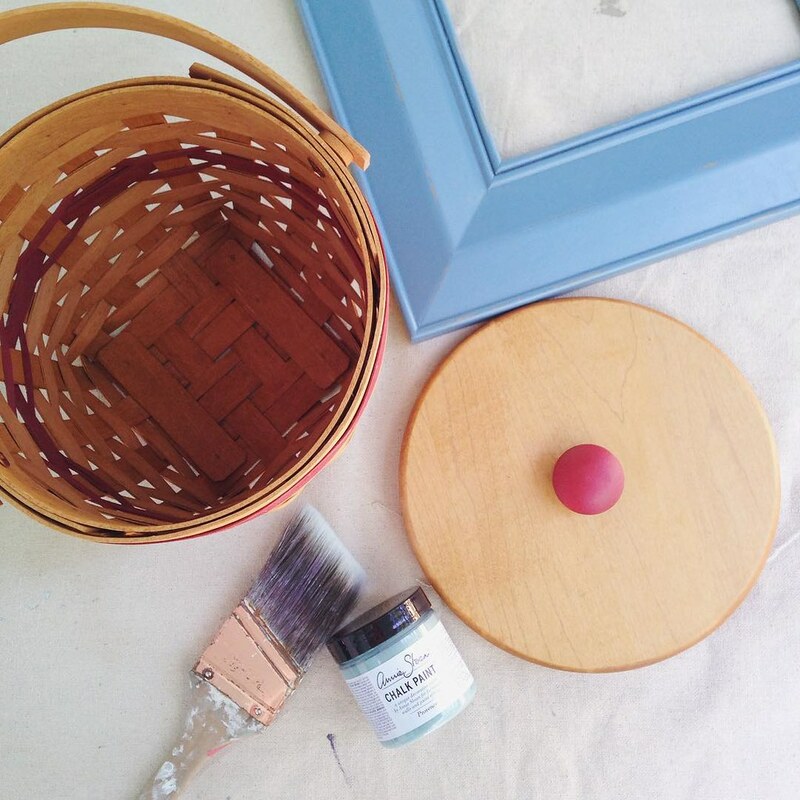 I was at it again this weekend painting a Longaberger basket with Chalk Paint! I have quite a few of these basket and most of them live in closets because the colors aren't just right for my home. I'd really like to enjoy using them again so a few of them have been painted! I know, you may cringe at the thought of painting one of these baskets but I figure I'll enjoy them much more this way. I've been seeing these baskets quite often at thrift stores so I like this idea of updating them instead of donating them! Here are the two that I've painted so far. They do take quite a long time to paint and I've used a combination of a big brush and a small brush to get into all the spaces with the paint. Each basket took two coats and I did paint the inside as well. The paint I've used is Annie Sloan Chalk Paint. 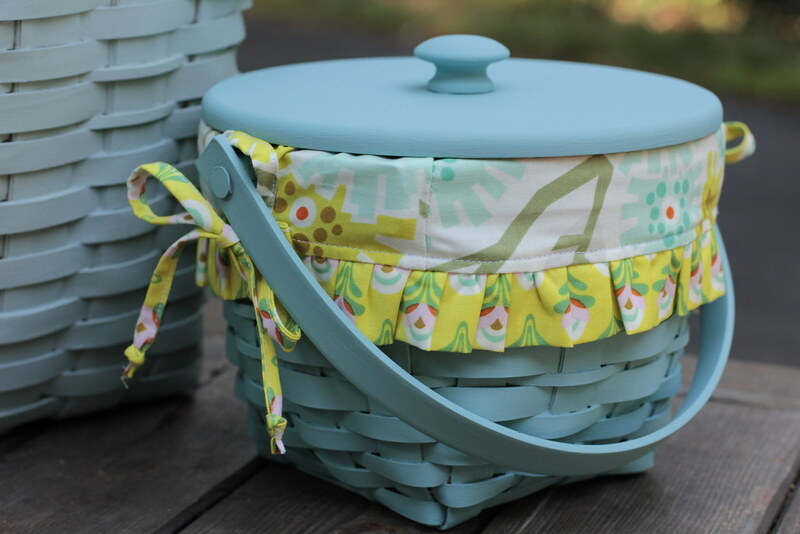 The color of the big basket is Duck Egg and the small is Provence. 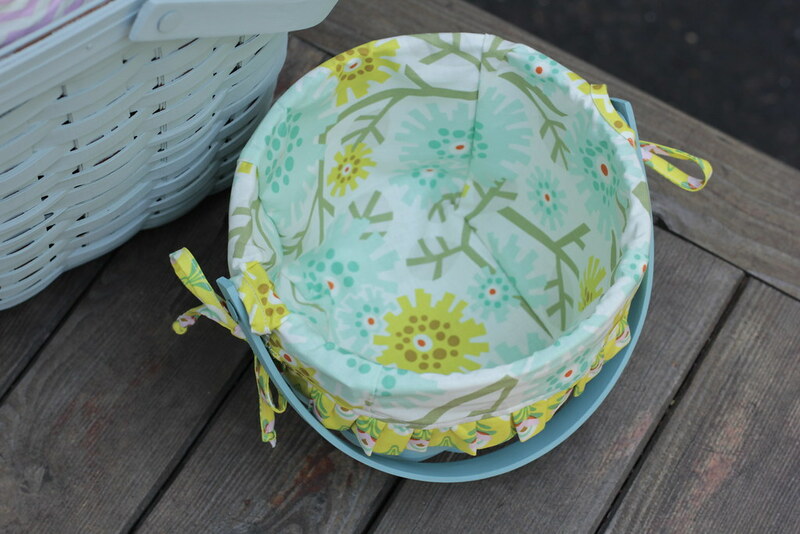 I haven't waxed either basket but I've thought of trying it on the small one. This small basket is from 1994 and is called a Jingle Bell Basket. It had a Christmas fabric liner in it so I cut it apart to make a pattern for a new one. It's so cute now, even my husband was impressed with the results! The fabric is from a collection called Clementine by Heather Bailey for Free Spirit Fabrics. It's so cute! I'm inspired to make some more things with that collection soon. 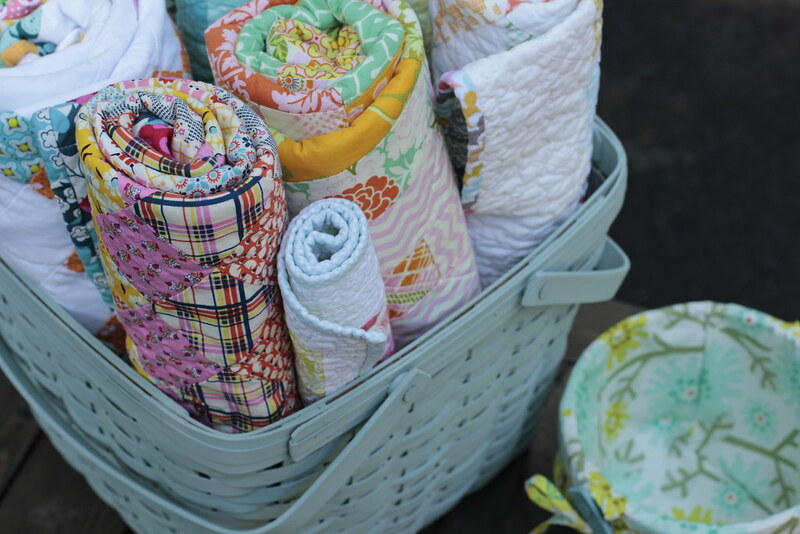 This large basket now holds lots of smaller quilts and lives in my sewing area. I love it now. 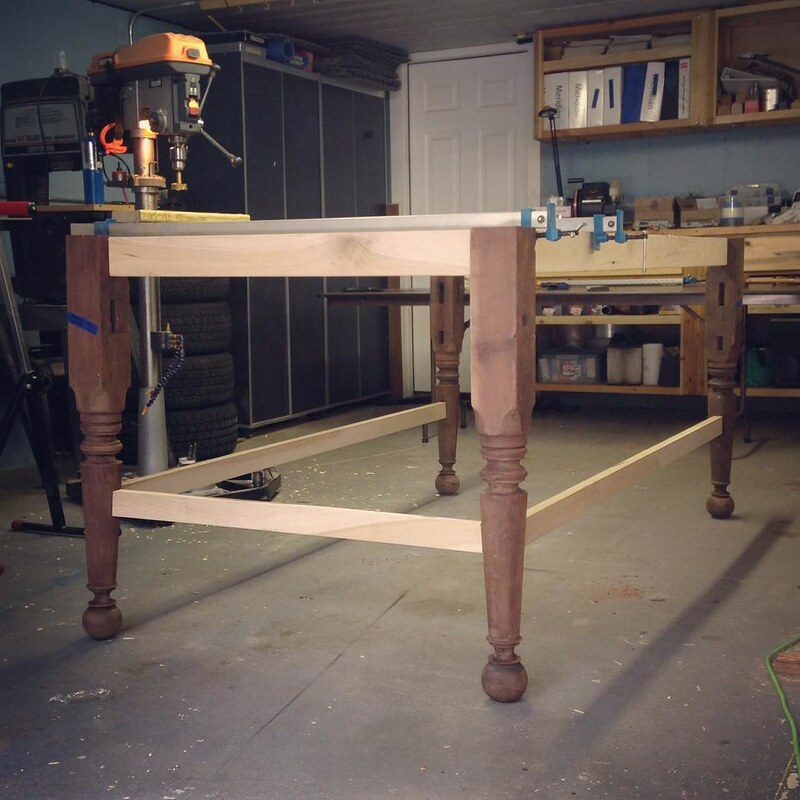 My husband has been working on a new cutting table for me. This weekend he worked on the bottom shelf. The table legs are from an old rope bed that I found at a neat salvage store called Cherry Pickers in Shipshewana. I love these chunky turned bed posts! The table is going to be nice and tall and I'm so excited to not have to cut everything on the floor anymore. I'm hoping this will save my back and provide a lot of storage for my slipcovering projects. Oh my goodness...you are my Monday morning wake up call...I love what you did with the baskets! I own a lot of these Longaberger baskets ...a bunch are just languishing in a storage room...need to freshen them up with paint. Thanks for the inspiration! Love the baskets. They look great with new paint & liners. I have so many that I don't use and now I can revamp them. These look great! I'm going to pull mine out of the basement and get going! Thanks for the inspiration. The baskets are beautiful! Wish I had some to paint! 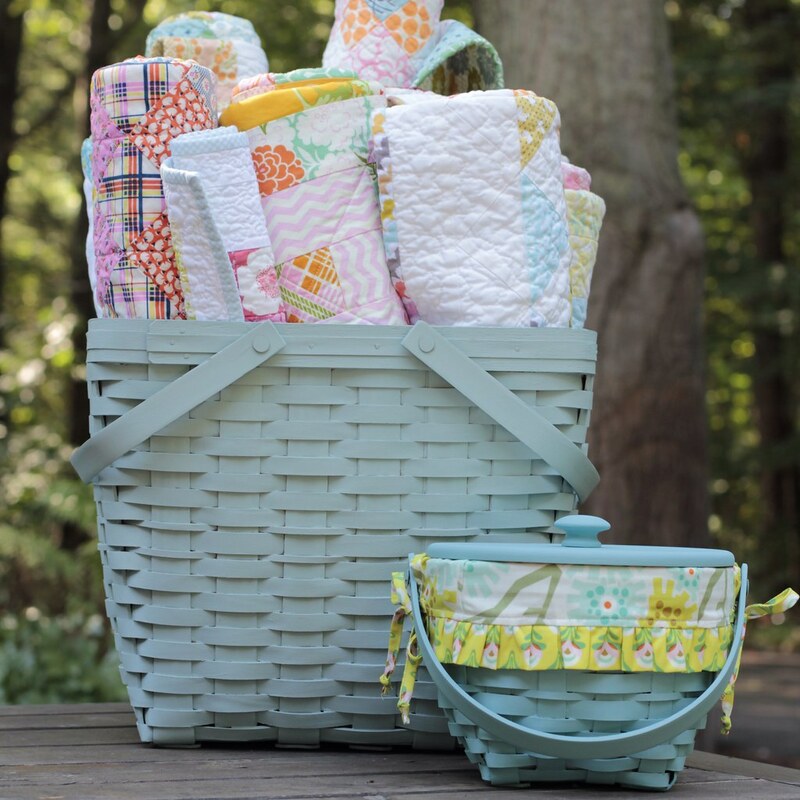 Love the baskets! I have a four poster bed I've been wanting to re-purpose. Your work table to be is a perfect solution. Thanks for posting your ideas! Hey, there it seems a new idea to Chalk Painted Longaberger Baskets. I would suggest you visit different types of light used in high mast light to get information on high mast light.